As 2019 marks 20 years of our existence, we’d like to celebrate it properly and we believe organizing an event for the National Board Members is the best way to do so. Our experienced members still remember the last international event organized in Łódź, CND in 2013, yet the younger ESNers are very much motivated to stand up to the challenge and become a part of a new chapter in our history book. 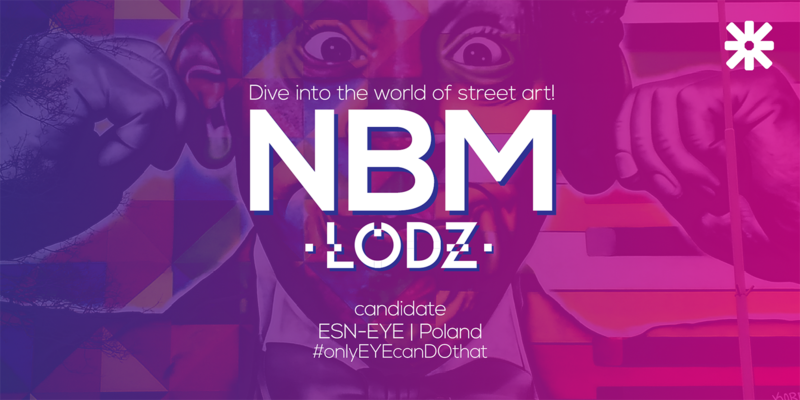 Seeing many of our members applying for the highest positions in ESN International, we’d like to bring this atmosphere and motivation back home and show that #onlyEYEcanDOthat! ESN-EYE, one of the biggest section in Poland, has been taking care of international students for 20 years. Among many of our Members, we managed to "raise" 3 IB Members, many Members of International Project Teams and Committees - now the time has come to bring this international atmosphere back home! International Faculty of Engineering is one of the most modern facilities at Lodz University of Technology. Our rooms are equipped with movable chairs, power outlets, projectors, touchboards and flipchart stands. The main room, the Aula, is suitable for up to 200 people - the room provides also 3 screens, a podium for the panellists and is equipped with advanced illumination technology. Our participant will be hosted in the dormitory of Lodz University of Technology. Each room is max. 2 people, some are single. All of them have private bathrooms and a little kitchenette. The dormitory was renovated a couple of years ago and therefore provides a very good standard. Łódź offers a unique experience - despite being the 3rd largest city in Poland, after Warsaw and Cracow, it's lesser known, called the Hipster of the Cities. It is often said that you need a local person to truly discover the hidden passages and backyards of the city. And that's exactly what we prepared for you! Dive into the world of the best street art in Poland, hipster caffees with unusual design and architecture gems from the end of the 19th century, when art nouveau was in full swing. Piotrkowska 217 is a place off the beaten track, known for its food truck festivals. Filled with many cafes and restaurants, as well as places as rollerskating park, it's a perfect spot for our integration! OFF Piotrkowska show the true spirit of the city, it a go-to place when you're in Lodz. What used to be an abandoned factory (a tribute to our industrial past) has now turned into a vibrant area with cafes, shops and a club. It was highlighted by National Geographic Poland as one of the 7 Wonders of Modern Poland. It's a popular venue for summer cinema as well, where you can grab a beer and sit back in one of the deck chair. This party will bring back the memories of 90s, when Backstreet Boys and Michael Jackson were on the top! YMCA, Asereje & Macarena - that's a real party and we hope to show you how you can party properly in Poland! Prywatka also has an open roof in the summer. Given summer time, we would like to offer a trip to Spała, a lovely town an hour from Lodz, where we would take the canoes and explore Pilica river. Spała also offers a magnificent side, called Niebieskie Źródła (Blue Streams), where water is perfectly blue, thus the name. It is the easiest to get there by a small bus or a train, depending on the number of participants. The price would include transportation, renting a canoe and a barbecue-style lunch. We have organized this kind of one-day trip for our Erasmus students several times and won “Project of the Week” in ESN Poland. That's it from our side, folks! Check candidates.esn.org to get to know our application and our budget.